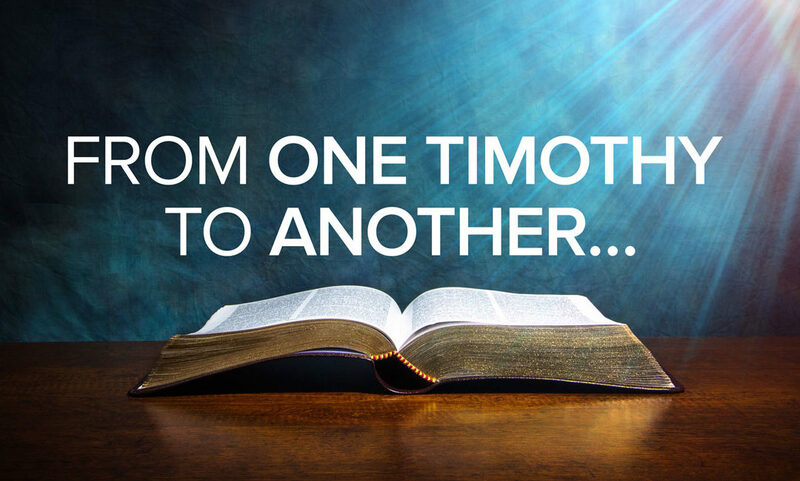 One of the most significant relationships recorded in the pages of Scripture is the friendship between the Apostle Paul, missionary to the Gentiles, and a young man named Timothy who was converted under Paul’s ministry and later entered into pastoral service as Paul’s protégé. I and II Timothy record Paul’s direction and instruction to young Timothy. These two books of the Bible serve as an example of a mentoring relationship between a wise, experienced pastor and a young man who has embarked on a lifetime of pastoral ministry. The value of inter-generational relationships among ministers of the Gospel is beyond estimation, and every young pastor who has a wise, older mentor to walk beside him and impart encouragement, insight, observation, and constructive criticism is blessed. Certainly, not every older pastor is equal in experience or wisdom; however, the troubling tendency of some younger pastors is to glibly dismiss the thoughtful contributions of older, more experienced pastors on the grounds of cultural irrelevance and the perception that their ministerial methods are outdated. And not only is the wisdom of older ministers easily dismissed, but the perspective of an entire generation of older Christians is often casually swept aside as insignificant and out of touch. In many Evangelical churches older saints are admonished to “get with the program” and embrace the sometimes whimsical worship appetites of the younger generation, and a failure to accept everything that is forced on them is generally perceived as the cranky stubbornness of carnal seniors. To be sure, there are sacred cows that need to be slain on the altar of effective ministry, and there are fresh, vibrant methods of Spirit-led ministry that need to be whole-heartedly embraced, but the alarming tendency to automatically favor the “new” and categorically dismiss the “old” is merely a reflection of the prevalent mindset of the broader culture which seems to place little value on time-honored wisdom. The Old Testament example of Rehoboam demonstrates the unfortunate results of a younger generation that emphatically denies the wisdom and perspective of an older generation. Upon following his father Solomon to the throne of Israel, Rehoboam stubbornly refused to follow the advice of his father’s experienced advisers, opting instead to follow the counsel of his younger, unproven peers, and his arrogance had gut-wrenching consequences—a great nation divided. Spiritual young pastors do not have to fall prey to the trending habits of their generational peers. It is possible to rise above generational trends and to cultivate an attitude of humility and maintain a teachable spirit that also allows elders to fulfill their God-ordained role in ministry. Many a young Bible college graduate freshly descended from the ivory towers of formal ministerial education and ready to right the ecclesiastical wrongs of all who have gone before him could use a fresh dose of healthy humility (and maybe a clearer understanding of reality.) This is not to dash the great hopes and confidence of a young pastor but to keep that energetic passion tempered by a spirit of Christ-like meekness. Closely related to the importance of a young pastor cultivating a spirit of humility is the necessity of maintaining a teachable spirit. How many difficult and heartbreaking situations could be avoided if more young pastors were committed to seeking the insight of older, wiser pastors? Education is invaluable, but there are many things that can only be learned through experience, and many experiences only come through the passage of time. History provides a unique perspective that nothing else can, and many older ministers, through the lens of experience, can offer a valuable viewpoint on current issues that younger ministers would be wise to consider. As we look back on the past, we may observe mistakes that were made and note methods that were simply a product of their time, but conversely, many of the thoughts and generally accepted opinions that are “new” in this day have not yet withstood the test of time, and one day, if the Lord tarries His coming, a succeeding generation will evaluate the values and viewpoints of this present generation, and they, in turn, will pass their own judgment. Understanding this reality should motivate us to demonstrate a spirit of graciousness in our estimation of those who have paved the way before us. Much like the children of Israel who, when they claimed the Promised Land, were given cities which they did not build, houses full of good things which they did not buy, wells that they did not dig, and vineyards and olive trees that they did not plant (Deuteronomy 6:11-12), we stand on the shoulders of those who have gone before us, and it would serve us well to view the wisdom, perspective, and contributions of an older generation with a heart of humble gratitude.